Uttar Pradesh is the most densely populated state of India. Its capital city of Lucknow is thus a prominent city of North India. It is, in fact, the second largest city of the region. The population here needs a mass transport system to help in the progress of the city and also make commuting much smoother. The intra-city connectivity is all set to get a major boost with the upcoming metro rail project that was announced in 2008 and is now making great inroads. The Metro project of Lucknow has two corridors. The East-West link connects Vasant Kunj to Lucknow Railway Station. The North-South corridor links Munshipulia to Amausi Airport. Additionally, a feeder system via bus services will be another advantage. The metro has been changing the face of Lucknow. A direct impact is a boost to the real-estate here, as it means new and upcoming areas that are away from the main city’s chaos, thus offering openness, are now smoothly accessible. There is an estimate for a capital appreciation in property prices of up to twenty percent (20%) due to metro rail. About 2000 acres of land is under various stages of development and planning due to the same. 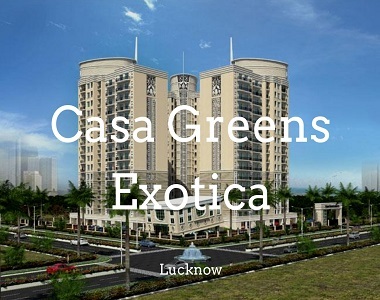 One such promising project is Casa Greens Exotica. The location is in Vrindavan Yojna. The plot adjoins 2 parks. Hence, it is open and green inside and outside as well. The campus is connected well and is also a beautiful enclave. On the offer in Casa Greens Exotica Vrindavan Yojna are 2 and 3 BHK apartments. These range in sizes from 1095 sq. ft. to 1695 sq. ft. Hence, these are comfortable in space. The master bedroom has a walk-in closet. The units are open from three sides. Lots of freshness and light thus percolates in every corner. The finish is classy. Hafeez Contractors have designed the project. The external amenities here are quite remarkable. There is a club house, meditation centre, shopping centre, Laundromat, kids’ play area, swimming pool, gym, convenience stores, sports’ facilities, waiting lounge, landscaped green parks, car parking, open spaces, and power back-up. The security runs 24 / 7 with manned access points as well as video cover in common areas. The campus is 80% green and open. This is thus a great place to enjoy a carefree and enjoyable life. Zip in here from all over the city via the suave metro!